Click on the map to check the unemployment rate in your state. Unemployment declined in 41 states in September, seven of which are key battlegrounds in the election. But falling unemployment rates don't necessarily point to improvement. Ohio, which has 18 electoral votes up for grabs, saw its unemployment rate decline to 7% in September, down from 7.2% just a month earlier. While hiring has picked up slightly in the state, unemployment is partly falling for the wrong reasons. Ohio added about 51,000 jobs in the last year, but more than 40,000 people also dropped out of the state's labor force. Meanwhile in Florida, which has 29 electoral votes, the job market has made more steady progress. But you wouldn't know it from the unemployment rate, which stood at 8.7% in September, higher than the national average of 7.8%. Florida's labor force is growing, which is an encouraging sign. More people are trying to get jobs in the state, and they're getting them. Over the last year, hiring has not only kept up -- it has grown at a rate five times faster than Florida's expanding labor force. Over the last year, the state has added 34,000 professional and business service jobs, 21,000 health care and social assistance jobs, and 11,000 retail jobs. That said, as one of the hardest hit states in the housing crisis, it still suffers from a loss of construction jobs. "These numbers today tell us two things -- we still have more work to do to grow our economy, and we are heading in the right direction.," Florida Gov. Rick Scott said in a statement. Nevada, which has six electoral votes, continues to have the highest unemployment rate in the country at 11.8% in September. That's an improvement from August when its rate was 12.1%, but the decline was due to a combination of both positive and negative developments. 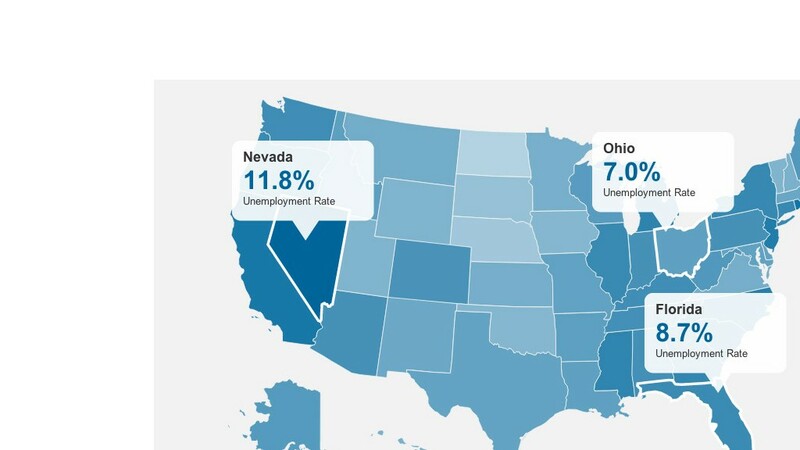 Nevada is seeing modest job growth but like Ohio, its labor force is also shrinking, and like Florida, it has yet to recover most of the construction jobs lost in the financial crisis. Swing states Wisconsin, Colorado, Iowa and North Carolina also had declining unemployment rates in September, while the unemployment rate remain unchanged in the battleground states of Virginia and New Hampshire.